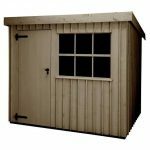 When people see this shed in your garden they may think you have found some old classic style, English shed and have restored it…… well that is the aim of this amazing line of sheds from Crane. Using those classic, East Anglian sheds that populated many gardens years ago as inspiration. 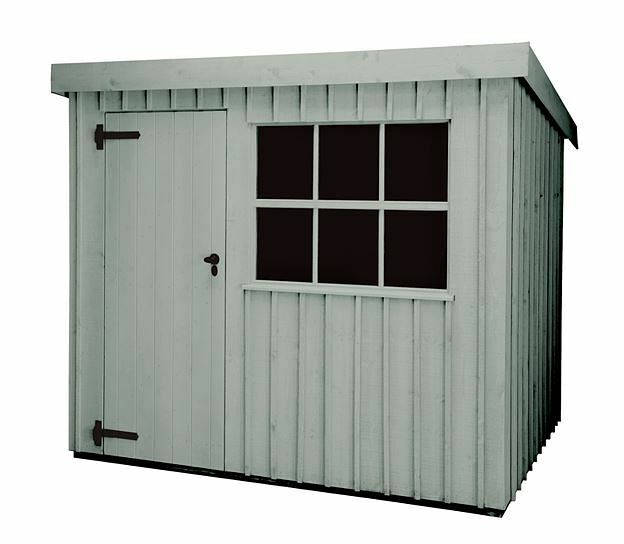 The Oxburgh shed is a nice sized shed that has a classic look and will be sure to keep all of your items. 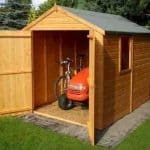 It is a shed that will just ease and blend into your garden without dominating it and let’s not forget 8 X 10 is a good amount of storage space. 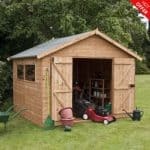 While at a first glance this is a shed that may seem “basic” there is a great deal going on in the design of this shed. 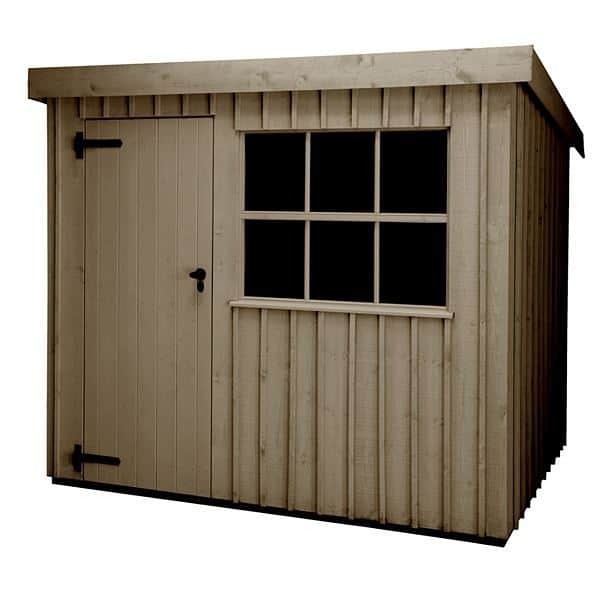 With its apex, pent style roof, tough glass windows and a nice sized door, you do have a good solid shed that is easy on your eyes and will be ideal for all your garden storage needs. Up to 12 weeks for installation!!! There are a number of fantastic sheds in this National trust series and right here we are going to put The Oxburgh Shed through its paces and see if this “basic” shed is worth the price tag. So grab a cup of tea and see what we think of this shed! Out of all there, National Trust style we think that this shed right here perhaps captures that classic, English style best. You have a nice amount of head room here with 6 feet 2 inches being the eave height. Crane keep their sheds under a certain height to make sure you do not have to get any special planning permission. You have a ton of floor space to store your mower, tools, gardening gear or whatever you need. The length is a very impressive, 9 feet 8 inches and the width to go along with that is 7 feet 8 inches. To really maximise your space we think some nice shelves on the walls would be a great idea. As far as the roof goes the shed has a pent roof that is made from corrugated sheet metal. Pretty much 99/100 old English sheds would have this kind of roof and seeing it here is a great throwback. 16 x 125 mm tongue and groove boarding is what Crane are using here under the corrugated roof and this is standard with this line of sheds. We are more than happy with this as we feel it is good and reliable. The pent roof design is something you do not see as much these days so we really like that. And as well as looking decisive, classic the pent roof will make sure no rain will ever sit on top of the roof. Most sheds these days will go for shiplap, feather edge, overlap, square edge or some other kind of “in” cladding style. Well here we have some very classic, flat sawn board cladding. This looks very nice and thanks to the Scandinavian Redwood that Crane have used is not only nice to look at, it will also last you for many years and be able to take a bit of “hustle and bustle” if you have any kids. This type of cladding may be “classic” but we love it as it certainly does a great job in keeping the rain away. We know that some people may think flat sawn board cladding is not as tough as some other types of cladding, but that Scandinavian Redwood we just mentioned is strong and so are the 38 x 50 mm floor joists that Crane are using to hold it all together. This frame is made from that same kind of wood and it is more than strong enough to take the odd bump with the lawn mower or even when one of the kids or grandkids thinks the side of the shed is a goal post! The flooring here is perfect for this kind of shed. It is 16 x 125 mm thick tongue and groove boarding which if that sounds familiar is because it is the exact same boarding we just talked about as the roof boarding. This is great floor boarding and is not too bouncy and will be able to hold a lot of weight so your mower, tool box and even a bench if you want will cause no problems at all for the floor. Crane use these floor joists which are 38 x 50 mm and they are just that perfect size to give a little bit extra protection. This is the standard flooring for this range of sheds and we know “standard” makes it sound incredibly average, but the reason Crane use this flooring is because it is so reliable and strong. The key term of the warranty with this shed is “general wear and tear” Crane are more than happy within the two years of your warranty to come to your home and make any repairs or replace something that needs replacing. 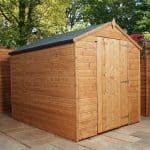 When you spend this type of money on a shed, you need to keep in in good shape, but just be sure to know that accidental damage is not covered by their warranty. To be fair we are happy with the warranty they offer and the shed is made with high quality materials so as long as you look after it you will be fine. 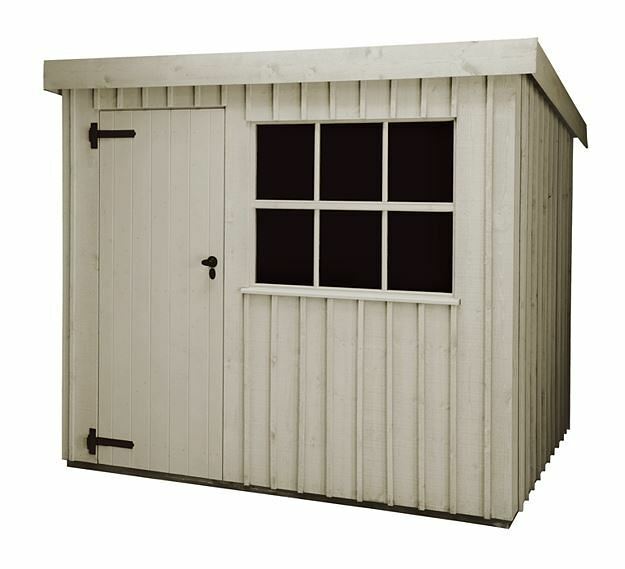 As is the case with the other National Trust sheds here we have a 710 x 1800 mm door. This is a good size door that will make sure you do not have to fight with things to get them inside…. Unless you are trying to get something ridiculously big in there of course. To make sure that after a couple of years the door is not hanging off the hinges so bad you literally move the whole door off when you want to get inside, Crane are using black strap hinges which first of all look really nice, but they will also last and stay strong for many years. To go along with the black strap door hinges we have a nice black door handle that of course is practical, but it also looks great as well. The most standout feature of the front of the shed we feel is those Georgian windows. The frame has been made by an expert joiner and best of all they are using actually glass. Many sheds will save a couple of quid by having cheap, plastic style windows, but here we have some nice 4 mm, toughened glass which if you take care of it will be nice and clear for years and be up to the task of taking a hit from a tennis ball if you have kids around! While there is a fairly big window on the front of the shed we feel that the design of the shed does keep things “under wraps” to be extra safe you can if you want put in a curtain or a blind, but honestly we do not think that is necessary. There is a good door handle that will not come off after about a month of use and to go along with this they have a mortise lock…….. perfect if you are using this shed to hide all your moonshine! 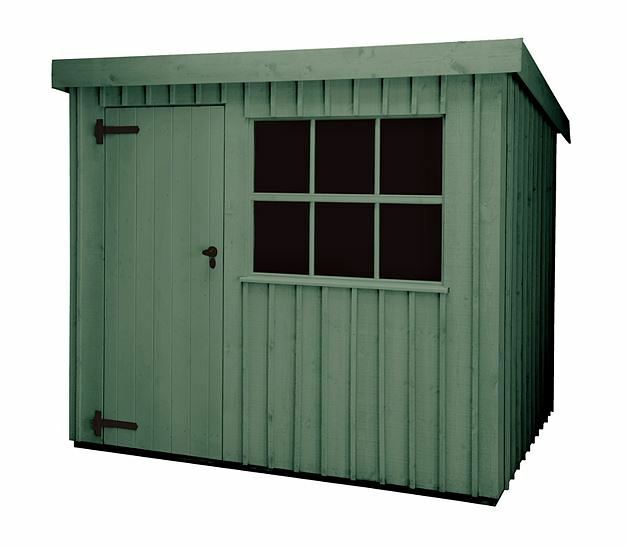 Offering six different colours to pick from, The Oxburgh Shed will fit in anywhere! Crane give you six different colours to pick from being, Earls Grey, Painters Grey, Disraeli Green, Terrance Green, Dome Ochre and Wades Lantern. 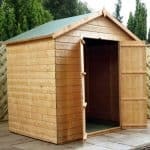 This line of sheds is known for being made with high quality materials and this shed fits right in. 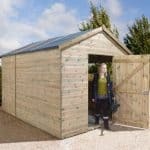 Using high quality corrugated roof sheeting and most of the shed being made from Scandinavian Redwood, we really cannot fault the overall quality of this shed. 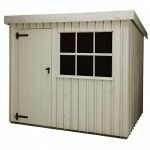 This is a proper “storage” type of shed and what it lacks in flash in its overall design, we feel will actually make the shed last just a little bit longer. The shed is expertly designed and no water will be getting in here thanks to that. With the proper love and care this can be a shed that will last you as long as you need. At 8 X 10, you have more than enough storage space for what the average garden needs. A mower, tons of tools and other things as well will fit in here with room to spare. Thanks to the strong walls, you can really maximise your available space with some shelving on the walls. We have to give the shed full marks for this as Crane will not only deliver, but they will install the shed as well. 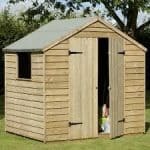 Look this does everything that you would want a shed to do, but we have seen sheds of similar size be available for under half the price! But at the same time the materials that are used here are very “top of the line” type of materials that are designed to last a long time. Final Thoughts: Out of all the sheds in this line, The Oxburgh Shed may be seen as the least impressive from a “looks” point of view. That is kind of true, but you have to keep in mind that you are getting a very well built shed that offers good storage space and will be built by Crane themselves…….. still £2,395.00 is a lot of money to pay for a shed that will be used primarily for storage and not be some kind of “feature” in your garden.